Black Widow has been a fixture of the Marvel Cinematic Universe since 2010 when Scarlett Johansson first played the character in Iron Man 2. That being the case, many have expressed desire for a Black Widow solo movie and it is something that Marvel Studios is "committed" to doing at some point, but when will that be? Scarlett Johansson has offered an update which is somewhat encouraging, but doesn't make it seem as though the movie is going to be happening anytime soon. Scarlett Johansson is set to appear on the cover of the latest issue of Total Film Magazine, with a feature story about her upcoming Ghost in the Shell movie inside. Games Radar was able to release a little bit of the interview where the actress offers an update on the status of the Black Widow movie. Here is what she had to say about it. "I've talked to Kevin Feige about it. We're creatively really compatible. I think we both agree that the character is right for a standalone, it's just a case of timing at this point for both Marvel and myself. Marvel has a really huge roster. They're looking four years ahead. I also have a lot of things that I want to do. If I did it, I would dedicate myself completely to making it amazing. It would have to be the best version that movie could possibly be. Otherwise, I would never do it." This mirrors statements she has made about the movie in the past, but it is still good to know that the Black Widow movie is still on the table and part of the discussion. Currently, Marvel Studios is focusing a lot on Avengers: Infinity War and Avengers 4, which recently started filming in Atlanta. Scarlett Johansson will be appearing as Natasha Romanoff in those movies, so fans will get to see her back in action soon, even if it isn't in her own, solo movie. As much as fans want to see the Black Widow movie happen, Johansson did express she does have a bit of apprehension, but ultimately thinks the movie can work. "[I] don't know if I have the capacity for it. I think the fans were adamant about it, it could be done. It should be done, probably. It'd have to be done the right way, though. It'd really have to be its own standalone and its own style and its own story. But there's a lot of great stuff that you could do with it. It could just be awesome." 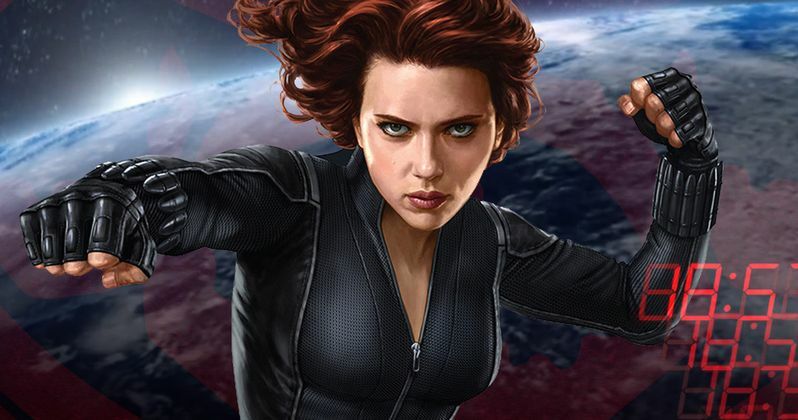 Many Marvel fans have been clamoring for Scarlett Johansson to get her own MCU solo movie as Black Widow for a very long time, and many were very upset when that didn't happen when Kevin Feige announced the Phase 3 lineup. The fact that the movie hasn't been greenlit yet is only made more surprising as it was recently declared that she is now the highest grossing actress of all-time at the box office, much of that because of her work with Marvel. She has also proven she can lead her own movie with something like Lucy, which grossed $463 million worldwide. It also looks like Ghost in the Shell could be another very big hit for her. At the moment, Marvel is going to have to get through Phase 3 of the MCU before they can focus on giving the green light to the Black Widow movie. Even if that is part of the plan for Phase 4, we won't know for a little while. Kevin Feige recently said that even revealing any titles for Marvel Phase 4 would be venturing into spoiler territory, since it hasn't been revealed what is ultimately going to happen in Avengers: Infinity War and Avengers 4. It seems more than likely that at least a few characters are going to meet their end at the hands of Thanos. If Black Widow manages to make it out alive, maybe she'll finally get her own movie, but that is at the very least a handful of years away.